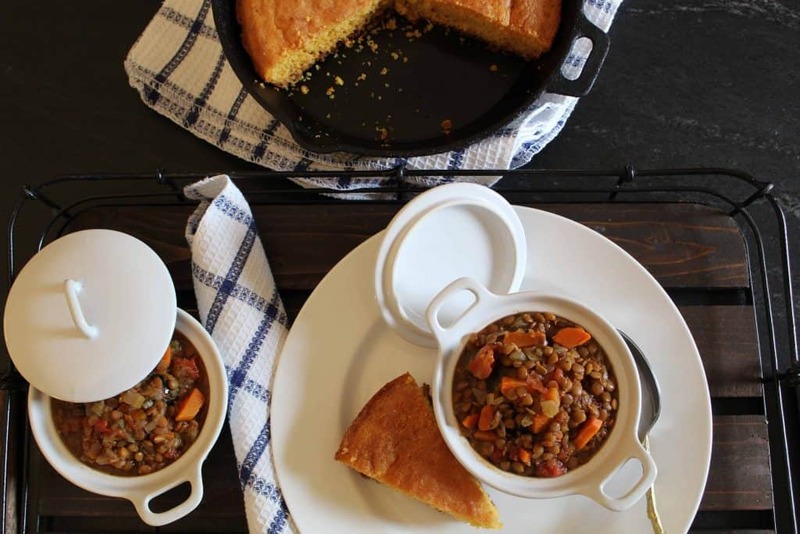 Healthy Lentil Soup is a welcome addition to the menu anytime of the year! Lentils are legumes and are naturally low in fat and high in fiber. Lentils do contain carbohydrates; in fact, 1/2 cup of cooked lentils has about 20 grams of carbohydrates. If you’re on a low-carb diet, you can still have healthy lentil soup, but you’ll want to reduce your portion size. Fiber is important in our diets for various reasons including the absorption of carbohydrates. Carbohydrates are essential for energy; however, some of the foods we eat are “bad” carbs–simple carbs like pasta, cookies, cakes, etc. Lentils contain”good”, complex carbohydrates, which break down more slowly than simple carbs, and assist in our bodies absorption process. The complex carbohydrates in lentil soup will provide you with energy and a feeling of satiety for much longer than a piece of cake or pie. Plus that, your blood sugar won’t spike with complex carbs. How Do I Make Healthy Lentil Soup for Vegans? The base of this recipe is chicken broth, however, if you’re making a vegan version, you can substitute the chicken broth with vegetable broth or water. Can I Add Protein to Lentil Soup? Yes. If you want to add a protein to the lentil soup, you might add cooked chicken, beef or turkey. As a side note, you can refrigerate and re-heat the healthy lentil soup the next day, however, it will thicken in the fridge. You can either add more water, vegetable or chicken stock to thin the soup when re-heating. 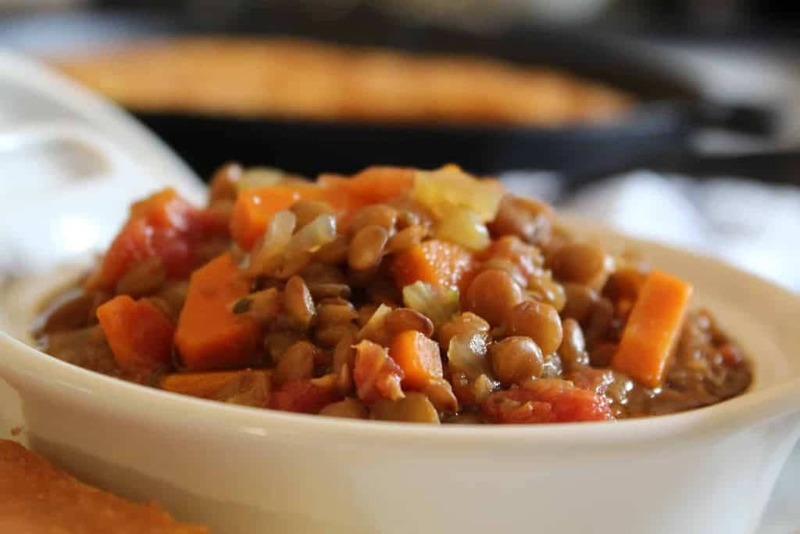 Lentil Soup is delicious, easy to make and ultra healthy! This recipe in total takes about an hour to make because I like to bring the tomato mixture to a rolling boil then let it cook for about 20 minutes; however, you don't have to cook the tomato mixture that long--I think it allows the flavors to marry and cooks off some of the acidity from the tomatoes. 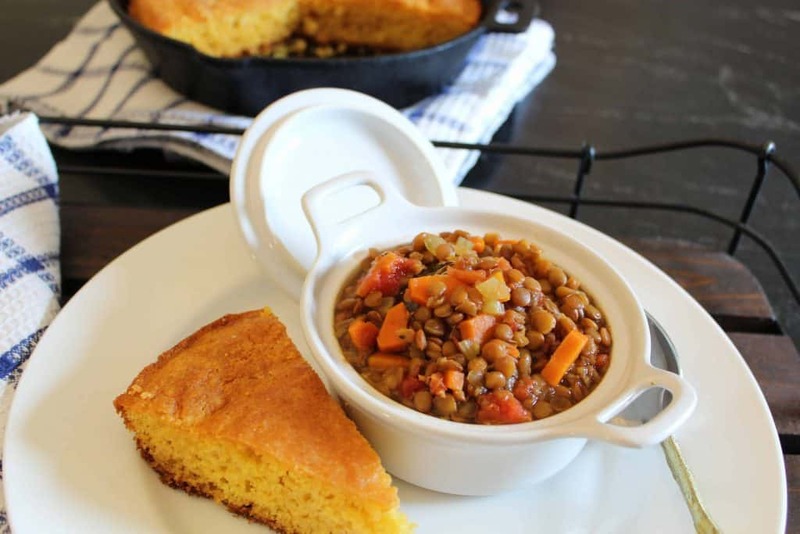 I always like to make a batch of homemade cornbread with my lentil soup!